Schenck' s Newton 1 in-motion train weighing system. Inset shows one of the sensors, without a stone guard. THE Newton 1 in-motion train weighing system from Schenck was recently upgraded to the Disomat B Plus control system. The controller upgrade allows simpler initial setup, quicker calibration and most importantly, allows the use of fieldbus communications by Modbus, DeviceNet, Profibus and Interbus S - an important consideration in remote installations. The Disomat B Plus is also legal-for-trade. Disomat B Plus is Schenck's field-proven weighing terminal, with a wide range of weighing applications. The system has many advantages and in case of fault, all control components can be replaced without the need for recalibration or reverification. The original Newton system was designed to acquire weighing data from moving rail vehicles quickly, safely and cost-effectively. Newton 1, with Disomat B plus, was recently installed at a Western Australian mine site to monitor the loading of ore cars. The system now provides a more efficient and more economical in-motion weighing. Newton 1 weighs each wheel and each side of the carriage, while the train is in motion. 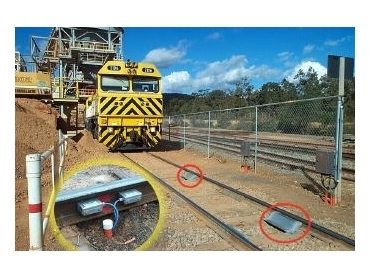 This allows the checking of the consistency of the loading of each wagon. Unevenly loaded carriages may result in unnecessary wear of the wheels and rails, with the potential of fines from the rail authority. As well, unevenly loaded trains have the potential for the derailing of carriages. Newton 1 is characterised by reduced infrastructure cost. There is no need for foundation work, less cabling, as the weighing electronics is mounted in the field housing, and faster installation time.